You can't lose when you have the best on your side, and on your feet. The GEL-TACTIC indoor court shoe offers maximum cushioning thanks to double ASICS GEL in the rear and fore foot, meaning your highest jumps are followed by the softest landing. The open mesh upper provides your feet with excellent breathability and ventilation. This is particularly beneficial to counter the amount of sweat and moisture that is built up as you play. The sweat and moisture is actively and efficiently wicked away to leave your feet feeling cool, dry and comfortable so you can remain fully focused on performance without distraction. A toe guard helps to increases the shoe's durability whilst defending feet from scuffs and scrapes across the court. An EVA sockliner is moulded to the shape of the foot, which can be removed to accommodate a medical orthotic. 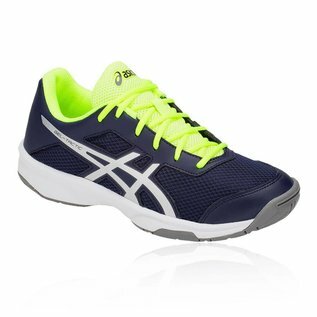 The Asics GEL Midsole attenuates shock during impact and toe-off phases and allows movement in multiple planes as the foot transitions through the gait cycle. Exceptional cushioning is provided to give you supreme comfort around the court without having a negative impact on your joints. The outsole of the shoe uses a compound containing more natural rubber content than traditional solid rubber, resulting in enhanced traction on court systems. A Trusstic System reduces the weight of the sole unit while retaining the structural integrity of the shoes.